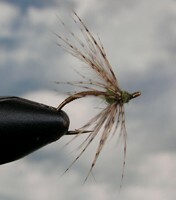 The American term is Soft Hackle but we know these flies as Spiders, often referred to as North Country Spiders. If you look you will find a number of patterns for this simplest of flies. here we feature a couple of options. 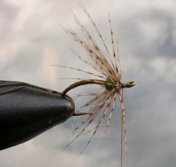 Follow this link to watch Davie McPhail tying the fly on YouTube. He has a very relaxed style of presenting his videos which are easy to follow and learn from. Fishing the Partridge and Orange Spider. As a young lad I first learned to fish this fly “down and across.” Simply casting the fly at a downward angle across the river, allowing it to drift around in the flow and often finding takes at the end of the swing as the fly rises with the natural straightening of the line. Casting upstream is great option which can be very productive, just using a short upstream cast and allowing the fly to dead-drift just beneath the surface, perhaps with a lift of the line to induce a take. Fish the fly singly or as part of a team of perhaps three spiders. Some advise to team up three versions or different sizes of the same spider, or alternatively in a mixed team of spiders experimenting with the Partridge and Orange on top dropper, middle or point. If you’re new to buying flies please remember to choose flies which are dressed to attract fish, not to attract the angler, our friends at Anglers’ Lodge will keep you right. Whether you tie your own or want to buy them this club has a great relationship with The Anglers’ Lodge at Jubilee Lakes where you will find a great selection of materials and flies and can enjoy a small discount when you show your W&DAC membership book. Enjoy fishing the Partridge and Orange.